A good bench vise will clamp smoothly, securely and feel like a second pair of hands. The best work bench vise models compared. A bench vise performs a myriad of tasks, predominantly based upon it's ability to clamp items between the jaws. Most workshops - both homeowner and professional ones, tend to have at least one general purpose workbench vise available. They are - in a way - almost like an extra pair of hands, and much like a pair of bolt cutters - they're an incredibly useful type of tool to have around. A vice will happily hold onto piece of stock, allowing you to work on it with confidence or set it together if it's a repair. There's a variety available - soame are better for woodworking and crafting, other better suited to industrial standard tasks and environments. The five best selling work bench vise models are featured below. This is the best entry level hobby vise - and a great product for those that enjoy crafting or woodworking. It can grasp and hold adequately enough to allow you to work as you you've got an extra pair of hands. The variety that it offers in terms of angles/positions is more than enough to please even the most diligent of hobbyist or wood worker. The internal clamp screw means that you can secure in to a convenient surface, plus the swivel ball mechanism between the base and the jaws really does allow for plenty of maneuverability. The vise is manufactured out of an aluminum alloy/steel combination with provides a good quality solidity and the jaws have a pair of removable pads that come in handy for more delicate work. A good little vice, perfect for the homeowner and on offer at an attractive discount price. Made of durable cast aluminum. 2 7/8'' jaw opening can hold a wide range of items. Removable jaw pads. Ball pivot design allows numerous lockable positions. 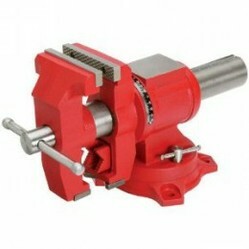 This is a good quality heavy duty bench vise and comes from the well known brand, Olympia. It's solid enough to handle a hard days work yet still small enough to do more focused, detailed work. It bolts onto an existing bench which provides a lot of stability and once sited, the vice itself offers a good level of versatility. The jaws can be use with rubber inserts, which is good for anything that requires a more gentle touch, and they also rotate through a full 360 degrees. You can clamp a variety of shapes and sizes - ranging between flat edged and rounded items. A nifty feature is the small anvil face that's incorporated into the design and, overall - this is one to consider purchasing if you need a mid-sized heavy duty vise. This is the best selling woodworkers vise - and all the best rated, with a five star endorsement. It's absolutely superior for woodworking tasks, and feels as though it would work well enough in either a professional or hobby environment. It's design revolves around being able to hold a fair variety of woodworking pieces and the jaws are drilled and ready for using with alternative facings - though these must be bought separately. The jaw sizing is 3-1/2" X 7-1/8", which offers a good range and it offers a steel dog and toed-in jaw - nice and versatile. Overall it performs well, provides a stability that allows you to confidently work at the task in hand and there is scope for additional use if you purchase the second style of facings. Great vice, great price. This is the best drill press vise and is about as affordable as it gets when it comes to the price tag. It can be mounted on pretty much any machine table and the low profile design is delivers a supreme level of stable, precise clamping. The manufacture is solid fine grain cast iron - it's definitely a sturdy little vise, and the jaw plates are fully replaceable. It's capable of clamping round stock with no issues and has a group of four separate slots that allow for a good solid mounting. An awesome machine - if you need a top quality drill press, then you need the Palmgren one. This is both the best portable bench vise, as well as being one of the best selling models. It's second to none for hobby users and its highly portable, lightweight design makes it a great buy for those that do a lot of small detailed work or crafting. It will easily and securely clamp on to any surface that is up to 2" thick and the jaws will open up to a pretty impressive 2 1/2" - wide enough to provide a good level of versatility. There's a set of double guide bars, which makes for a more accurate clamping action, plus they're steel plated with makes them feel more solid - as well as delivering from the long term use point of view. A cracking small bench vise - and a steal of a deal at it's current sale price. I have Some Concept Problem But After Reading Your Post My concept Got Crystal Clear. Thanks For Sharing The post" " .. It was full of note worthy . I like reading Post On your website because it goes Excellence And With a charismatic .